The definition of ISO is based only partly in the physical sensitivity of film or sensor. ISO is a judgment about what exposure will produce the best results, on average, with a particular medium of capture. ISO is a compromise. 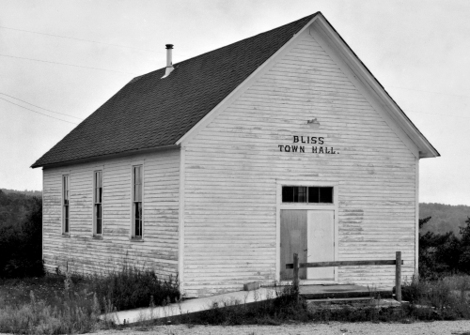 In 1955 Tri-X had an ASA (ISO's predecessor) of 200. In 1965 it was 400. The film hadn't changed, just the official judgement of what the best exposure was. 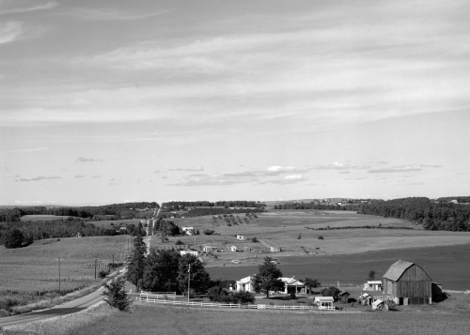 Higher exposure of B&W film produces better shadow detail, but increased grain and poorer sharpness. Shrinking film formats increased the importance of grain and sharpness in overall quality. The manufacturers decided the emphasis was too much on shadow detail at the expense of those, so ASA values were redefined. Negatives need sufficient exposure to produce shadow detail while not overly compromising grain and sharpness. Slide films must record sufficient highlight detail without having a slide that's unacceptably dark. Many negative photographers routinely "overexpose" by around a stop*. Many slide photographers "underexpose" their photos. We're all aiming for adequate information at the end of the luminance scale where the medium is most likely to fail us. ISO doesn't require you make a certain exposure; it's merely a best guess. But when ISO consistently guesses poorly for a majority of users, it ain't doing what it's supposed to. Digital sensors have problems similar to slide films; expose more than a certain amount and there's simply no detail. Unlike slide film, digital sensor's behavior in the highlights is not at all graceful. Once the pixel's potential well is full of photoelectrons, clipping occurs. In a purely linear device, that can happen 2–3 stops above middle gray (there are ways to improve that—many cameras do much better). At the same time as the highlights are getting clipped, there is usually detail well into the shadows, albeit with increasing grain/noise. 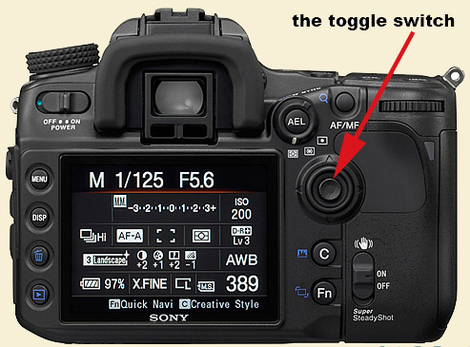 Cheapo digital cameras can capture a seven stop range; better ones 9–11 stops. In many cameras the luminance capture range is weighted too far in favor of shadows. Especially true as we notice loss of tonal separation in highlights a lot more readily than we notice it in shadows. From the comments I read about digital cameras (and my own modest experience) I think the digital ISO is simply too low in many (not all) cameras, often by more than a full stop. Many of us have already learned to "underexpose" as normal practice to more usefully balance highlight and shadow detail. We just set our exposure compensation dial for –1 or –1.5 stops and leave it there most of the time. This needs to be institutionalized. Digital ISO is due for reformation to provide exposures that more usefully exploit the sensor's exposure range, balancing adequate shadow and highlight range. On my Fuji Finepix s6500, changing the current ISO of 100 to ISO 250 would be about right. Both of these photographs were originally made in RAW mode by my Fuji FinePix s65000 camera. (Click on the images to see them larger.) The one on the left was made at ISO 100 with no exposure compensation. The one on the right was made with –1 stop exposure compensation. Both of these photographs were originally made in RAW mode by my Fuji FinePix s65000 camera. The one on the left was made at ISO 100 with no exposure compensation. The one on the right was made with –1 stop exposure compensation. I made a curves adjustment in Photoshop to the image on the right, so that the shadows would have about the same brightness in both photographs, for comparison purposes. The "normally" exposed photograph has blown-out highlights with little or no data in one or more channels. 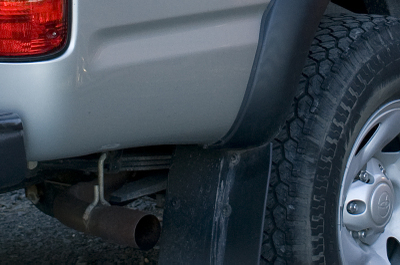 The "underexposed" photograph has good highlight detail and only a slight loss of clarity and separation in the shadows. So, which one would you say was correctly exposed? There would be side effects. A good one is that you get more low-light capability. Instead of hand-holding at 1/10th of a second, you're hand-holding at 1/25th of the second. The bad is that your pictures become noisier. It's a balancing act, just as defining B&W negative ISO was a balancing act between shadow detail, grain, and sharpness. But, digital image noise is already better than comparable speed 35 mm film in many digital cameras, and it continues to improve with each generation of sensor. Luminance capture is definitely not better than film in the highlights. I understand the current obsession among the digital newbies for low noise; I'm a fine-grain lover myself. But poor tonal placement is a worse problem that will improve less as sensors get better; it's more inherent in how the sensors map luminance values. We need a new ISO definition and we need it now. A friend just contacted me. He's thinking of adding an Elliott Erwitt print to his small but high-quality photograph collection (I know he's smiling at that description, since he owns a couple of my prints), and he wanted my input as to which ones are my favorites. Lord, that's like asking me what's my favorite breath of air. Some are better than others, but I like them all. "Favorite Erwitt" is redundant! I ended up telling him that if it were me, I'd probably buy a dog print. 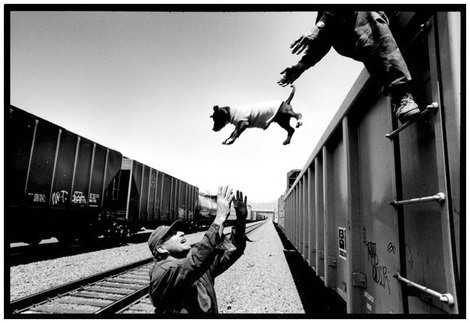 I have as much affection for Erwitt's dog pictures as Erwitt has for dogs. 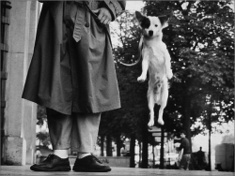 My sentimental favorite is probably the one of the little white dog jumping up in the air next to the legs of a splay-footed man in a raincoat, because I have a hazy memory that the man is actually Erwitt himself. I also really like the bulldog-in-the-lap picture. 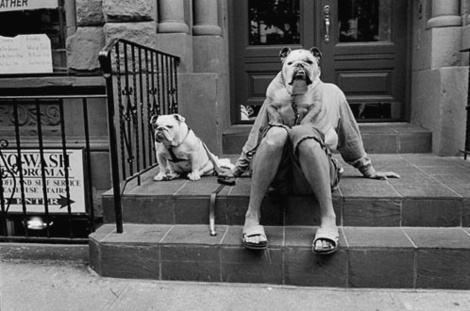 But then, once I start thinking of Erwitt's dogs, it becomes a mental parade that's not easily extinguished. What about the big old Airedale with the stick in his mouth? 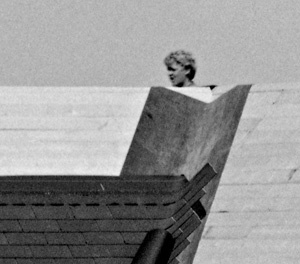 The dog on the rooftop? One thing I really agree with is that an Erwitt picture would be a lovely thing to have around the house and look at every day. I applaud my friend's decision. So let me pass along the question. If you had to choose only one, which one of all his prints would you choose to own? "Diane Keaton on Photography," a lovely little essay written by novelist Larry McMurtry about his friend and her photo book projects, for the New York Review of Books. Ricoh Corp. has announced an evolutionary update to its popular GR Digital, which has been on the market for exactly two years, since October 2005. Called the GR Digital II, the new camera features logical updates such as a 1/1.75-inch CCD with 10.01 million effective pixels, a 2.7-inch, 230,000-pixel display with a high 160º viewing angle, and a new processing engine said to "dramatically" improve high-ISO noise performance. 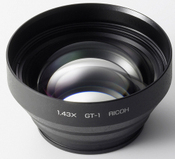 It has the same excellent, fast, 6-element in 5 group 28mm-e ƒ/2.4 lens as its predecessor. 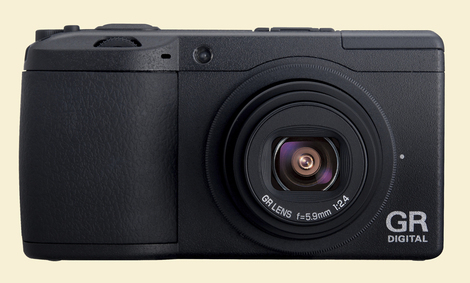 Other features include .dng RAW, a native square format feature like that found on the GX100, customizable B&W modes, and electronic leveling with visual or audible confirmation. New accessories include a new teleconverter lens that makes the lens into a 40mm equivalent (right), and a new external viewfinder. Write times for RAW have been improved from 11 seconds to 3.8 seconds, and you can now take a second picture in RAW while the first is still writing. RAW capture works in the camera's square format, too. Availability is said to be set for a month or two from now. Canon has apparently found a definitive fix for the autofocus irregularities first brought to public attention by Rob Galbraith on his excellent website—it's a misadjusted AF sub-mirror, thought to affect only a minority of cameras. For those who already own 1D Mark III's, Canon will check your cameras and repair them if needed, but will not offer refunds or replacement. Canon has also taken the unusual step of recalling all 1D Mark III's now in dealers' hands. There's no word yet on when the camera will resume shipping. 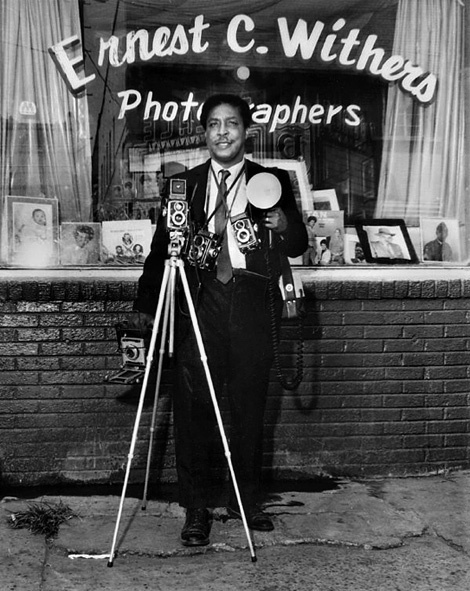 Civil Rights photographer Ernest C. Withers, a son of Memphis, Tennessee, was as proud of some pictures he didn't take as he was of many that he did: he was granted access to see Martin Luther King Jr.'s body at the morgue following Dr. King's assassination and refrained from taking "morbid" pictures because he didn't want Dr. King to be remembered that way. Mr. Withers died this month at the age of 85. Microsoft Corp. and Phase One recently announced a strategic alliance to explore ways to work together to develop solutions for the Microsoft Windows platform. Phase One is a leading provider of digital image capture and work flow management technology, including P+ Series digital backs and Capture One software. Phase One is an employee-owned company based in Copenhagen with offices in New York, London, Tokyo, Cologne and Shanghai. Chantal Stone, who wrote a series of posts for T.O.P. last year about notable photo blogs around the web, has a new website herself now. Check it out! A catalogue raisonné (RAY-zon-ay), for those of you who might not know the term, is a book that shows the full range of an artist's work in sequence. Technically, a true catalogue raisonné has to meet a number of scholarly conditions regarding completeness, with notes on condition, provenance, and location of the works, among other things, and it needs to address any questions of attribution. Because not all of this pertains to a mechanical printmaking medium like photography, the term is perhaps not strictly applicable. 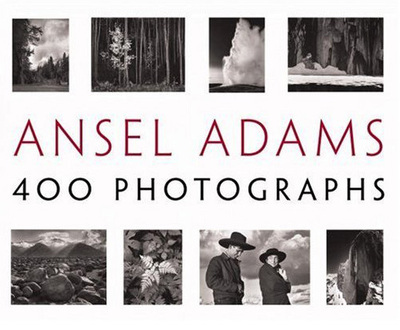 Still, the splendid new Ansel Adams: 400 Photographs published by Little, Brown is the closest thing we've gotten yet to a catalogue raisonné for Adams. It might not cover every negative he ever made, but it certainly contains all of his major work, divided into five periods beginning in 1916 and continuing through the 1960s. There are things here even I didn't know, and I thought I'd seen everything. It's not a large-scale book (and not expensive, either—a mere $26.40 if you buy it through the link, making it very good value for money until the price goes up), but the pictures are large enough to enjoy. The reproduction, consistently very fine although not quite matching the best, will not stand in the way of anyone's enjoyment either. Useful as an introduction to Adams for those who don't know his work very well, or as a handy single-volume survey of all of his work in chronological periods for those who are diehard fans. 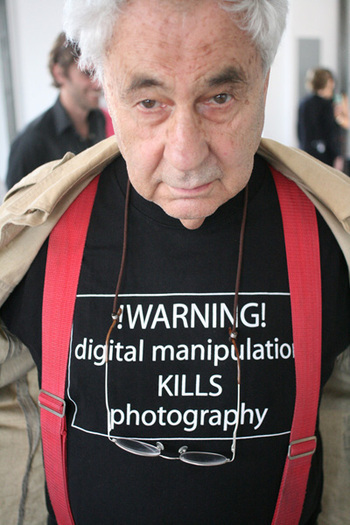 For anyone with a general interest in great photography: warmly recommended. 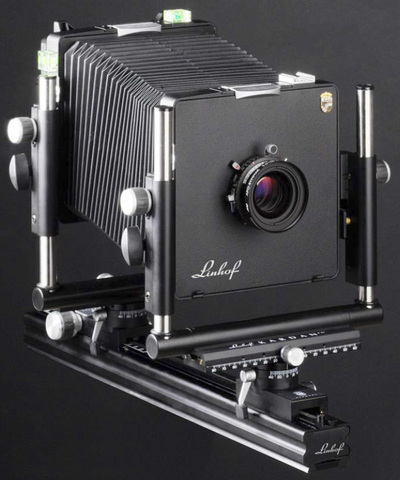 For lovers of landscape and nature photography or fans of large format: essential. For Christmas and Hanukkah: you could do a lot worse! The lower of these two pictures reminds me of a story. I was a high school photo teacher when I made these, and I made a 16x20 print of the lower picture and tacked it to the bulletin board in the art department near the school darkroom. The negative is perfect, so the print was quite beautiful, and I was proud of it. One day I saw two of my students standing at the board looking at it. They hadn't seen me and probably thought they were alone. I eavesdropped, thinking I might get some useful feedback. I expected they'd say something about the print quality, since they were used to 35mm Tri-X prints and didn't often get to see 4x5. They regarded it placidly for a while, and then one said, "Must be Mike's. Only Mike would take pictures of farmland." I started this project as a result of receiving a $650 (woo-hoo, big money!) faculty grant from the school where I was teaching. I used the money to buy a bunch of Polaroid film. Before I left home I did some test prints of the National Cathedral from various places around D.C.—sort of a fun project in itself—and made some prints so I could see how the materials behaved. I'd never used 4x5 before, so naturally I was impressed with the level of detail I could get in a large print (the prints I made were on 16x20" paper with a 1-inch border all the way around). So all summer I semi-consciously had two conflicting ideas in mind. For one thing, I conceived of the pictures as ending up in a book, so I was constantly thinking in terms of page spreads. (Remember, it was Polaroid, so I could futz with the little positives in the evenings, trying out pairings.) But the other thing I constantly found myself doing was paying attention to very small details in the pictures, relying on the materials to reveal these things in big prints. Of course, sometimes I took this a bit too far. This is probably the worst instance. 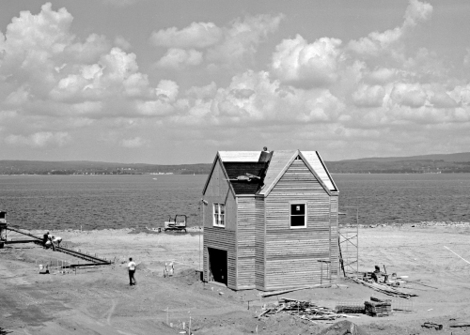 In the top picture, of the building of Petoskey's Bayfront Park, one worker's head kept bobbing into and out of view from the far side of the roof, and I timed the shot to get his disembodied head sitting on the roof peak. I don't know, but now I think it's asking an awful lot to expect a detail like that to carry a picture—did you even notice? I don't think it helps the picture at all. Even in a big print, never mind a book-sized one. 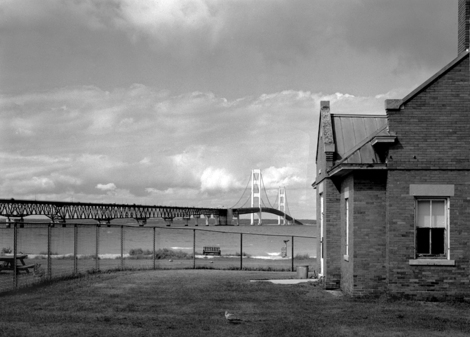 For me, these two pictures are the very heart or core of my old Michigan project. They're both simple, plain pictures, and perhaps they might come a little too close to cliché for some people who have a more profound appreciation for the State. And Michigan is not the only place you might see these things, of course. 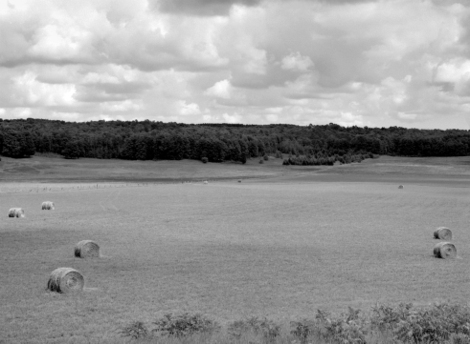 But for the me, the juxtaposition of a corn field and pine trees is a very Michigan-y take on America's most ubiquitous grain crop, and I get a smile every time I see this golf course picture—golfers with hand-carts on a course with a barn on it, that's just very Midwestern for me. 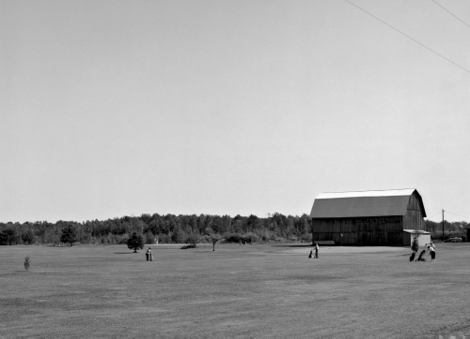 The original prints of all these are about 18" wide, and the scan of the second picture (although you can click on either image to see a slightly larger version) is almost too small to see—the green is in front of the barn, and the bright spot on the side of the barn is the flag on the flagstick. John Szarkowski thought the top picture "just missed" because it's too clean—he thought it needed a snippet of road or fencerow in the corner or on one edge, to save it from perfectionism. And the second picture is the only picture of mine that is in a major Museum collection. I think of these two pictures as "pure Michigan," each in its own quiet way. Incidentally, all of these pictures were taken with a 4x5" Wista 45DX on Polaroid Type 55 positive-negative film. 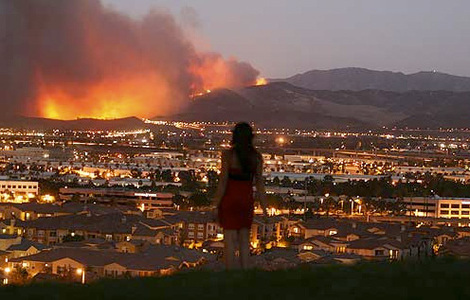 A photograph submitted to the L.A. Times by an unnamed Irvine resident shows a woman watching the approach of the Santiago Canyon Fire from Quail Hill. I don't often interrupt the proceedings here to discuss current events, but in recent days my thoughts have been with our neighbors and countrymen in Southern California, who have been dealing with catastrophic wildfires over the past six days. The figures are staggering: 772 square miles of populated land (half a million acres) have burned, fed (and unpredictably spread) by harsh, swirling Santa Ana winds. Seven persons lost their lives, along with many pets, wild animals, and livestock. More than 1,800 homes, many extremely valuable, have burned to the ground or are a total loss. More than 500,000 people had to be evacuated, most from San Diego County—the largest mass evacuation in the State's history. The final cost of the disaster will be measured in the billions of dollars. More than 13,000 firefighters were involved in fighting the fires, which are now largely, though not completely, under control. Interestingly, many news services linked to selections of amateur photographs of the fires on flickr and other photo-sharing sites. Our thoughts go out to those who have been dealing with the loss, disruption, and danger created by the fires. 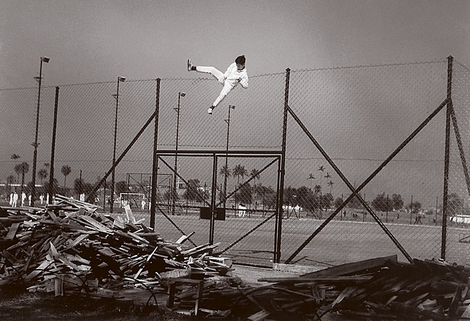 In the Autumn of 1997, Yau Leung was just starting to earn a minor artistic reputation when he slipped off a ladder in his studio, hit his head, and died. That the light should have left the eyes of Hong Kong's greatest photographer in so banal a manner makes contemplation of his passing especially difficult. If photographers are not felled covering disgraceful coups or scrappy jungle wars, posterity likes them to advance to gurgling senility, feted by models, retrospectives and hand-numbered editions. There is no romance in death by lapse of concentration — especially not in a man whose defining artistic characteristic was his undivided presence in, and intense focus on, the moment. I've been shooting with digital cameras since 1999 or so. I think my first was a Nikon 900. It was quite a change after working exclusively with a 4x5 since 1980—it was like using a Kodak disc camera (remember those? The negatives were the size of your fingernail). But I had a feeling that digital was here to stay, and I needed to learn a whole new paradigm. Then, of course, there was very limited and costly output. I hoped things would change. When the Sony F-828 hit the market, I think around 2003, I grabbed one. I spent the better part of three years working out a workflow and color management scheme for the F-828 and RAW with my Epson 9600 and a dedicated G4 print server. Got a Spyder2Pro monitor calibrator and Print Fix Pro colorimeter, creating my own profiles, the whole nine yards. The F-828 has been a durable performer with good optics, but I needed to make a step up. 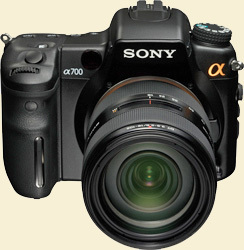 The Sony a700 was my first sortie into the DSLR market, and I wanted it to be a good first step. Comparing the specifications of the cameras in my price range of around $2,000, the Sony looked like a good choice. The a700 felt good the first time I picked it up. It's light and ergonomically comfortable. The screen is large and very easy to read. With the large icons and the single toggling "joystick," the menus are easy to navigate. The a700 actually weighs less than my Nikon F2! I think I only picked up the manual once to read about the differences in RAW and cRAW; everything else was pretty straightforward (cRAW, by the way, is a compressed RAW format). The camera also supports Adobe RGB, which is my preferred color working space for printing on the Epson 9600. All good. There was still some light in the sky when I got the camera so I ventured out the door and began shooting. Two things that had really bugged me about shooting with the F-828 were that it could only record in RAW+JPEG, so the Flash card would fill fairly quickly and I would have to delete half the files when importing the photos. The other thing was a delay in capturing the image to the card. It took several seconds before I could make another exposure, and that really drove me nuts at times. Both of these issues were nonexistent with the a700: it shoots up to 5 frames per second at full resolution and had the option of only recording in RAW. The 18–70mm ƒ/3.5–5.6 "kit" lens seems very sharp, although I really want to compare it with the Zeiss Vario-Sonnar T* DT 16–80mm lens. The auto-focus response was quick and smooth and it only tries to focus when you put your eye to the viewfinder, but that is just one of the four auto-focusing control settings to choose from. There are also wide, local, and spot focusing modes as well as a focus hold button, all very conveniently located. I just really enjoyed shooting with this camera right out of the box! The downside is that Aperture, Capture One, and iPhoto do not support the new RAW data format yet, although they all support the a100, so I suspect in time everyone will support the a700. Adobe Camera Raw does open images but I am not sure it is interpreting the information as well as it could—the images seem slightly overexposed. Upon analyzing the images I see very little noise and fringing (one thing the F-828 was not great at). As you can see there is good definition in the shadows / highlights and the clarity is very good. Granted you are viewing a compressed JPEG on the web. I would be happy to answer questions about the a700, but I'll be in D.C. this weekend and away from "the internets," so don't expect answers before next week. The upshot for now is that I've been shooting for about three weeks and I am very happy with this next step in digital imagemaking, although I still miss the traditional 4x5 negative and printing from it. Of course I don't miss the brown fingernails and smelling like fixer all the time. 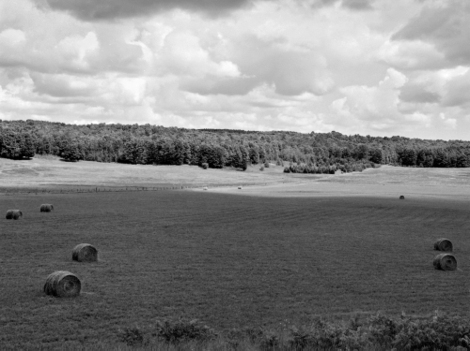 A Northern Michigan field, off Ely Road near Pellston Airport—the darkening sky was middle gray, and so was the field, and so were the posts—if I print this the way it really was, it looks all wrong, so I have to goose the contrast shamelessly just to make it seem reasonable in a photograph. Although the grasses did look all shimmery like that, if my memory is correct. 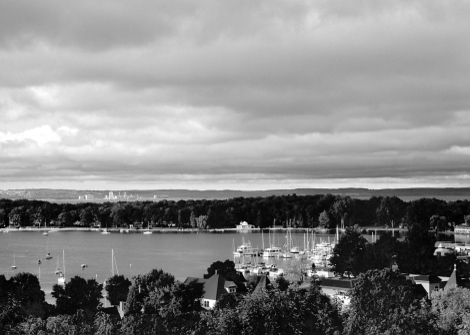 The picture below is of the town of Harbor Springs, taken from the hillside overlooking the town, toward the harbor and Harbor Point (where all the exclusive houses are—"The Point" is private, not accessible to the public, or to photographers). Beyond the point you can see Little Traverse Bay and the old power plant west of Petoskey, which was demolished in spectacular fashion some years back. 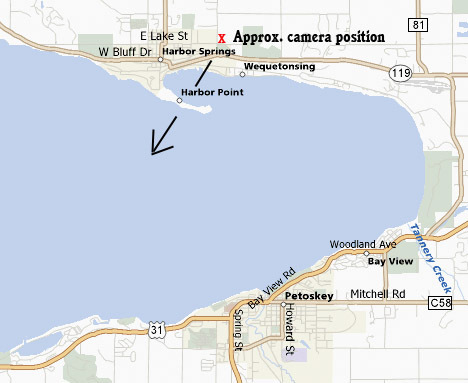 This little diagram is very approximate—I think the camera position is much closer to the water than that, but the "X" wouldn't fit. It's just to give you a general idea of what you're looking at, across a small body of water and then across a larger one. I scanned these much closer to web resolution, and the second negative, which is quite thin, resulted in some rather astonishing scanner artifacts in the darker trees. I hope they don't show up well enough that you can see them. Featured Comment by Scott Hill: "I've taken a lot of long bike rides down the roads these Michigan shots show, Mike. 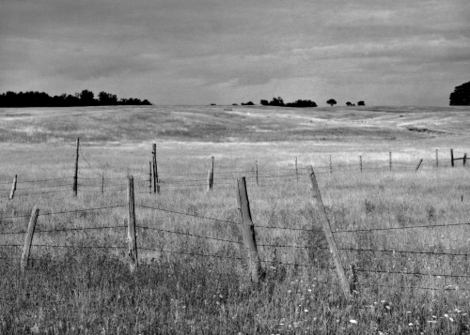 "But from my recollection, there are not that many fence-posts as I see in the image here—did you add, remove, or move some posts before you took this picture? I've been trying to read the shadows to see what time of day it was, but that's getting me nowhere. "Maybe I've been reading too much about cannonballs lately." From 2wenty 4our. Agency: Advico Young & Rubicam, Zurich-Gockhausen, Switzerland. 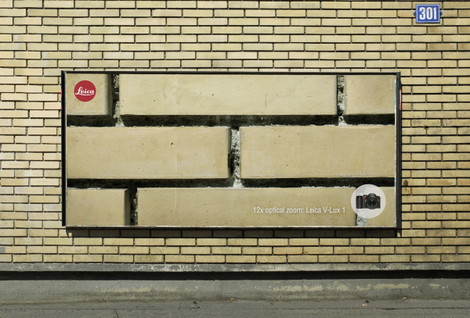 Note that there is a similar campaign for Panasonic. 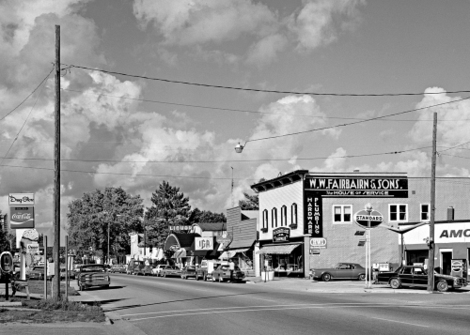 I'm going to keep putting up some of my large-format Michigan pictures, but, pace one of the comments, you mustn't expect too much fidelity on your monitor. These are quick-and-dirty JPEGs pulled from the original scans. I'm a) not going to correct the full scan files until I've begun printing them, because if I did I'd probably have to re-do everything anyway once I started printing, and b) I'm not going to work forever on small JPEGs to get them "just so" since the only use I have for them is to post them online, and everybody's monitors are different anyway. I'll get them in the ballpark, and then you'll just have to let your visual imagination take over. On your screen, some of these will doubtless look better than others. The final form of any of these would be prints, nothing else. Since yesterday I heard from Doug Fisher of BetterScanning.com. 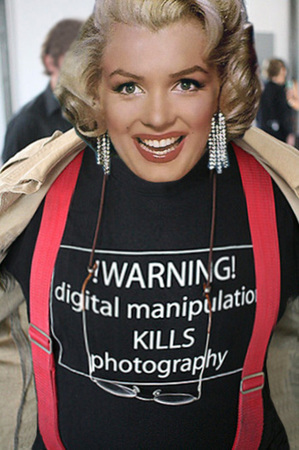 He had another valuable tip for getting good results from the Epson V700. Doug says, "I couldn't tell from what you wrote if your issue was one of disappointment compared to a scan from an expensive high-end scanner or if maybe a setting was incorrect. Just in case it was the latter, one thing that is not explained well and that has tripped up a lot of my customers is the software setting that switches between the two fixed-focus lenses. The 'film with film holder' setting chooses the lens that focuses somewhere around 3mm off the glass and which has a more shallow depth of field. The 'film with film area guide' switches to the lens that is supposed to focus at the plane of the glass bed (I say 'supposed to' because these relatively inexpensive optics have focus-point variance). I mention this because I have found many people who said they were obtaining terrible scans found that they just needed to switch the software settings. You must make sure the 'film with film holder' setting is selected any time you use a film holder. This setting sometimes mysteriously gets changed, so it is important to double-check it before each scan is started." Consider it done. Doug also offered to send me one of his custom-made 4x5 film holders for the V700 (he also makes holders for 35mm and medium-format film), which should be interesting as the stock Epson holders come in for criticism in most reviews. I'll keep you posted. Two scans from today. These are the same picture, of course. 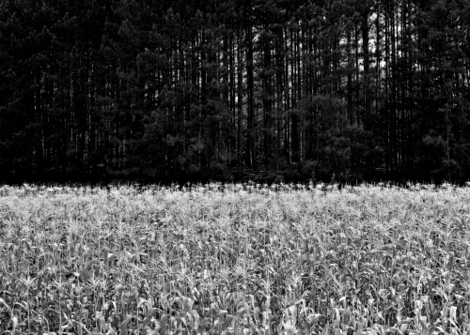 Well, two pictures taken from the same standpoint with the same framing of the same place, a hayfield in a shallow vale. 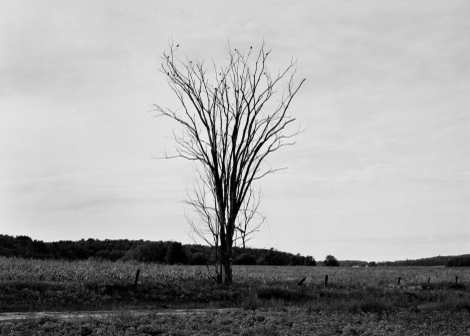 If you photograph in the Great Midwest you soon learn not to demand that your landscapes be heroic. There are no towering mountains, giant waterfalls, or sweeping vistas. The landscape is much quieter, more gentle, and you have to learn to be content with that. Part of its beauty can be found in the clear air and the sweep of the clouds over the land, and the way the light and shadows bring a change of scene. The light makes all the difference. I don't think these two pictures were taken more than five minutes apart. There is tract housing in this place now. I need a flatbed scanner to scan prints for my magazine articles, which I submit via email. In general, though, I have very bad luck with scanners. I am not good at making them work, for one thing. For another, they keep breaking. My last scanner acquired an infuriating tic that made it useless: there was a hard line in the middle of every scan, on one side of which the scan was just a little lighter than it was on the other side. This was infuriating because it seemed like a very small, almost trivial malfunction, aside from which the scanner worked perfectly. But when you are scanning illustrations for magazine articles, you can't have a hard line in the middle of every picture with a difference in tone on either side. It won't do. After months of arduously correcting this defect in Photoshop—which was not as easy as it might sound—I decided the scanner was useless, and put it aside. This is another problem for me with scanners. When the scanners break, they don't seem quite broken. When a mechanical piece of equipment breaks, I fix it. When an electronic thing breaks, my brain still goes, "Maybe you can fix it." Even though I can't. So instead of throwing it away, I put it aside. It seems too close to "working fine" and not close enough to "irretrievably busted" to throw away. This is not smart behavior. If you persist in this behavior, sooner or later your basement and your garage fill up with useless junk, and they do a show about you on afternoon TV called "Conquering Clutter." I have not reached that point yet, but it is something I know is a risk for me. Anyway, I bought an Epson V700 to scan prints with. It works fine. So far. The V700 is also supposedly good for scanning negatives. So I tried scanning some 35mm negatives. Either it's not good at scanning negatives, or I'm not. Maybe some V700s are good for scanning negatives, but, as Oren says, "Consumer scanner specifications are all hype and voodoo and quality control is mediocre anyway. Experimentation with your own sample is the only way to know what it can do and whether it will meet your standards...In the world of scanning-voodoo, you take whatever seems to work for you and run with it, regardless of whether it's what someone else says is best." Maybe some V700s are better than other V700s. It's difficult to tell exactly where blame should be ascribed. Let's just say this V700 operated by me can't scan 35mm negatives worth jack. But it comes with a 4x5 holder, and it seemed reasonable that it might do better with larger negatives, so I rooted through several closets (uh, filled with junk) and some of the shelving in the basement and found a box of negatives I made in 1987 in Michigan with a 4x5. This is the first scan I made. It's from a Type 55 neg. Carl says he hasn't done much scanning "from itsy-bitsy sheet film" (he means 4x5), but he was able to give me a lot of good advice. The key piece of Carl-advice, for me, was to scan the negative as a positive and then invert it in Photoshop, rather than telling the scanner software that it's a negative. I haven't printed it yet, but it looks pretty good onscreen. Although I wish the pigeon weren't being modest and looking away from the camera. Carl says, "You've got a sense of the grain, but not a full rendering of it. But then type 55 is/was very fine-grained film." If I keep the number of pictures cut to the bone, people might even believe I did a pretty good job depicting the region. Working with a view camera wasn't terribly amenable for me. (Too slow. 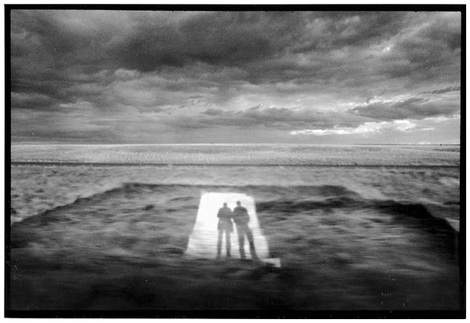 View camera photographers use the words "deliberate" and "contemplative" as euphemisms for slow. They still mean slow.) 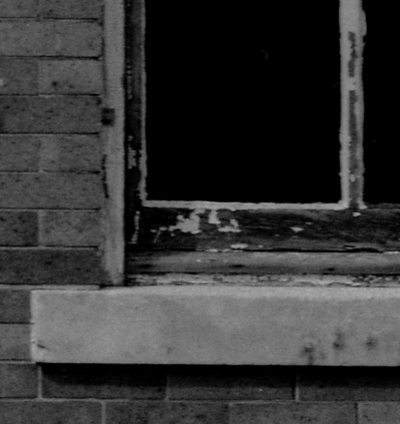 Incidentally, looking at these negatives again for the first time in a decade and a half or so, it's painfully obvious to me now that I was simply working with a lens that was too long. I was under the influence of a guru at the time who recommended a 210mm (8-inch) lens as one's first or only lens. I see wide, not narrow, is the problem there. The pictures make it obvious that I was just struggling with the focal length—the bridge in the picture above was one of the few things that I was far enough away from to make the lens make sense. I sure wish I had fallen under the spell of a guru who insisted on a 5- or 6-inch lens. To continue, these initial experiments have whetted my enthusiasm for working this way deliberately: that is, shooting 4x5 film to make negatives ideal for scanning, and then scanning them on the V700. It seems like it would be a lot of fun. The slowness of view cameras might not be so bad now, because I've gotten more deliberate and contemplative since 1987. Maybe it's fast enough for me now. Which is how I find myself idly shopping for a view camera. I can't afford the view camera I really want, not because I can't afford it absolutely but because the outlay doesn't seem like a smart allocation of limited resources given what I'm going to use it for: probably, wide-angle documentary shots of a small town in Wisconsin that absolutely no one needs or will want to buy. (Or possibly even want to see—even in said small town.) So I look online at used cameras. But that's no fun, so lately I've been looking at "entry-level" new cameras. This doesn't really make any sense at all; I don't need a new camera. I just bought a new camera, albeit of a completely different type. (I'd show you, but my monoblock broke recently too.) That doesn't stop me from looking. • New play-free solid brass micro drive for extremely smooth focusing of the camera on the monorail. • New design and improved handling of the operating knobs with anti-slip rubber rings. • Optimized angle scales for easier reading of Scheimpflug adjustments. • Additional spirit level at the rear standard for control of horizontal leveling. • Red marked zero position of vertical shift. ...All of which sounds just great, although I wasn't aware that these points were shortcomings of the Kardan E.
Anyway, you see how this works? Equipment begets equipment. One day my cheap flatbed scanner starts putting a hard line down the middle of all my scans, which leads straight to being dazzled by gorgeous little Linhofs. Featured Comment by David Kelly: "Mike, the reverse can also be true. My daughter, whose visual talents far exceed mine, shoots a Nikon FM3a with a modest assortment of three lenses, but needs to share her work with friends online and wants to learn digital printing. 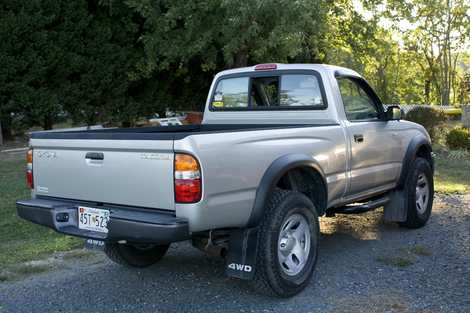 So she was on the verge of buying a D200 body and all that goes with it, for about a grand and a half. AF lenses in their expensive multitudes would then have beckoned. Instead she bought a Microtek i900 hybrid scanner, which costs roughly a hundred bucks less than your Epson, yet in her inexpert hands does a fine job with both 35mm negatives and prints, plus even legal-sized documents so she can not only go on shooting her beloved little FM3a but also get rid of her fax machine. Maybe she just lucked out. But my point is in this case equipment prevented a purchase of more equipment. and saved her at least a thousand bucks." Thom Hogan over at bythom.com has written a very helpful essay called "What's Your Goal?" that I commend to your attention. 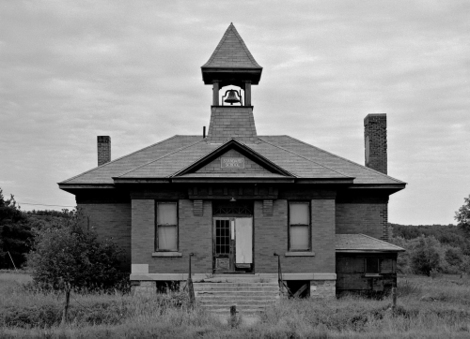 It takes up where my more fundamental essay "Getting Better: The Crucial Sentence" leaves off. Thom's piece is very well done and I don't mean to criticize it, but there is one tiny flaw in its logic. At one point he counsels that for goals to be useful, they should be ambitious. As an expert in this sort of thing, I happen to know that this is circular reasoning. Ambitiousness is a predicate of goals in the first place. You must have ambition to feel you need goals, much less get to the point where you can write them down. All goals that are clear enough to write down and not be embarrassed about are already ambitious. It's a small point. Now I'm going to scratch one of my own goals off the list. It was, "Write a clear, concise, and above all practical essay for photographers about setting goals, or find one somebody else wrote that is as good or better than I could write myself." Then I'm going to take a rest. Achieving one's goals is satisfying, but tiring. Most weeks I write one post that's not about photography. This week's off-topic bleat is a little cautionary tale called "Nine Dollar Gas." You can get to it from the Sunday Sermons page (it's listed at the top). I hope after reading it, you'll stay home today. And watch the baseball game. Ralf Brunner tells a story without words in 58 photographs. UPDATE: Here's "the real link," to the story on Ralf Brunner's own site (thanks to Martin Winkler). In some ways the format of the spurious site is an advantage—don't neglect the fact that the story is a sequence of pictures from first to last, and on Ralf's site should be viewed left to right, top to bottom, all four pages in order. Much more powerful that way. Maarten Boerma wrote to say, "I live in the Netherlands. At the moment there is a very beautiful exhibition called Belgicum in Antwerpen, Belgium, of the Belgium photographer called Stephan Vanfleteren. He is famous photographer in the Benelux." There are a number of fine projects on Stephan Vanfleteren's website, including (under "Recent Projects") a whimsical sequence from a bicycle race. These two pictures are from a series on hobos in the United States. According to the website, "Vanfleteren works as a freelance photographer for the weekend supplement Zeno in the newspaper De Morgen [The Morning]. He also works for international magazines and invests a lot of time in personal projects." Well worth exploring for those outside Benelux who don't know his work.